The section of our website regarding service of Bucklins, specifically in the Revolutionary War, is hopefully going to be expanded when we receive a contribution of a few hundred dollars. We have much information, but no funds or volunteers to finish the research and put it into electronic form to then have our webmaster format it and put it into the website. By 1775 the Rehoboth Militia was a force of 210 persons. The force was divided into at least three or four companies, apparently each in a different part of the township of Rehoboth. Originally chartered in 1774 by the town of Rehoboth as a town Militia unit, the Rehoboth Militia was comprised of both ordinary Militia and Minutemen. The Minutemen were men of the Militia who volunteered to be ready to march “in a minute” after being summoned. There was a Joseph Bucklin who marched as a Sergeant, with the Minute Man Company of Rehoboth on the Alarm raised for minute men to go to Lexington and Concord to fight in the battle there in April, 1775. Two Bucklins went as privates. The company was commanded by Capt Bishop. [Erhardt, p. 724]. Other than Captain John Bucklin’s Minute Men company, a different company of the Rhoboth town Militia in 1775 was under command of Capt. John Perry and had as officers Lieut. John Paine, Ensign James Buklin [sic, should be Bucklin] and Sergeant Robert Sutton (probably the Gaspee Raider). There is a problem identifying the right James Bucklin who was the company Ensign, third in command. One possibility is the James Bucklin 3rd who was the son of James Bucklin 2nd and Mary Peck of Pawtucket, Born 30 Nov 1743. James Bucklin 3rd would have been 32 at the time of the Revolution. This age fits for being an Ensign with Sergeant Sutton (age 29) in the same company. There were several men named “James Bucklin” in Rehoboth, and the Ensign was probably not the one listed in Massachusetts Soldiers and Sailors of the Revolutionary War, v. 2 p. 755, as being fined £10 for non-service when drafted to serve in the Continental Army on 15 May 1777. Other than Capt John Bucklin’s Minute Men company, and the Capt Perry militia company that had James Bucklin as Ensign, there was a third company commanded by Captain Bishop. Capt. Bishop’s company had a Sergeant Joseph Bucklin. John G. Erhardt, History of Rehoboth, Seekonk, Mass., Pawtucket & East Providence, RI, 1692-1812, (PO Box 33, 500 Fall River Av., Seekonk, MA, 1990), 724, says there was a Joseph Bucklin who marched as a Sergeant, with the Minute Man Company of Rehoboth on the Alarm, with two Bucklins as privates in the company of Capt Bishop. (Query whether this Joseph Bucklin was Joseph Bucklin 5th, the Gaspee shooter? Erhardt’s notes don’t help with the identity. As stated above, by 1775 the Rehoboth Militia was a force of 210 persons. At that time the entire Militia force was under the command of Capt. John Daggett of Attleboro and Col. Timothy Walker of Rehoboth. On April 9, 1975, ten days before the confrontation between the British and American forces at Concord and Lexington, the entire Rehoboth Militia unit was sent to Freetown MA. Without a shot being fired, the English surrendered, and the Rehoboth militia seized, their 40 stands of British arms, munitions, and accoutrements. Ten days later the British forces countered by marching out of Boston to seize the arms and munitions of the nearer militias at Concord and Lexington. A Muster Roll of Capt. John Perry’s Company of Minute Men from Rehoboth, from the 19th of April to the 27th , 1775 shows Bucklins. Each man gave 8 day’s service. This is taken from Arnold, Vital Records of Rehoboth (1897). Capt. Perry had the following in a company in Col. Timothy Walker’s Regiment. These enlisted for 8 months from the 1st of August, 1775. Again there were Bucklins. Samuel Blisss, was afterwards General Washington’s steward at Morristown, in the winter of 1777. Thereafter, Capt Bliss commanded a company that had the following enlistees, for 8 months from April and May, 1775. Capt. Samuel Bliss, Lieut. Aaron Wheeler, Ensign Joseph Allen, Sergeant Aaron Read, Sergeant James Bullock, Sergeant Noah Allen, Sergeant Christopher Ormsbee, Corporal Nathaniel Bliss, Corporal Nathaniel Wheeler, Corporal Jonathan Macomber, Corporal Elijah Wheeler, Drummer James Wheeler, Fifer Cyriel Smith, Joseph Allen, Samuel Allen, Wiliam Allen, Ephraim Bless, Charles Bless, David Bliss, Levi Baldwin, Thomas Baldwin, Preserved Bullock, Isaaac Burr, Samuel Baker, Eliphalet Corbin, James Cole, Thomas Campbell, John Dryer, William Fairbrother, Simon Goff, Abel Hix, Joseph Ingals, ______ Ide, Oliver Jones, Labin Lake, Levi Lewis, Samuel Munroe, Jonathan Nash, David Perry, Sylvester Peck, Peter Read, Nathaniel Round, Richard Round, Comfort Robinson, David Turner, Nathan Turner, Valentine Wilmot, Jonathan Drown, Christopher Blanding. The following is a list of some officers in Col. Timothy Walker’s regiment. Col. Walker was a resident of Rehoboth as were also at least part of his officers . CAPTAINS: John Perry, Peter Pitts, Mason Shaw, Silas Cobb, John King, Daniel Parker, Samuel Bliss, Caleb Richardson, Jacob Fuller, Francis Liscomb, Olive Soper, Maxcy Williams, Samuell Tubbs, Jr.
Go directly to the Rehoboth Minute Men web site to learn more about that unit! Massachusetts Soldiers in the War of the Revolution. This is a list of some of the Massachusetts Bucklins who were soldiers. This is not a complete listing of all the Massachusetts Bucklins who were soldiers, it does not include sailors or officers of privateers. During the Revolutionary War the town of Rehoboth was in Massachusetts, and so this list does not necessarily include Bucklins who lived “outside of the Massachusetts Bay Colony” in the Rhode Island and Providence Plantations. The “London” and the “Prince” shown below as Bucklins in this list were probably slaves held by Joseph Bucklin 4th and enlisted at the consent or direction of their master. Joseph Bucklin 4th, of course, had a good reason to have the war fought vigorously, because his son, Joseph Bucklin 5th, who fired the shot in the Gaspee attack of 1772, still was the subject of a 1000 English pound reward posted by King George for anyone giving information that would get Joseph Bucklin 5th into English hands! It was considered appropriate to get someone else to serve as a soldier or to pay a standard amount to a fund to pay for soldiers, instead of serving yourself, when the town was called upon to produce a specified number of soldiers. Thus for example, Prince, a skilled ship’s blockmaker, might have been enlisted to serve for some relative of Joseph Bucklin 4th instead of that relative paying money or serving himself. More likely, however, in the case of Joseph Bucklin 4th, who was relatively wealthy, it was a matter of contributing manpower for the Revolution. If a man’s wife was expecting a child, or if there was some other socially acceptable reason, it was socially and legally acceptable to pay the amount “fined for non-service” instead of serving an enlistment. Thus the William Bucklin shown at the end of this list may have been the 22 year old son of the privateer captain Daniel Bucklin, and William had a pregnant wife, or William may simply have been off to sea privateering with his father, who was successful in capturing a number of English ships. Bucklin, London, Providence, R. I. (also given Attleborough and Northampton. Descriptive list of enlisted men dated May 21, 1781; Capt. Watson’s Co., 3d Mass. regt. ; age, 21 (also given 18 and 23) yrs. ; stature, 5 ft. 3 (also given 5 ft. 4) in. ; complexion, black; hair, black; eyes, black; occupation, blockmaker (also given laborer); residence, Providence (also given Attleborough and Northampton); enlisted for town of Attteborough; enlisted April 3 (also given March 3), 1781; enlistment, 3 years; reported ordered to be delivered to Cot. William Shepard at Springfield; also Private, Capt. James’s (4th) co., Cot. Michael Jackson’s (3d) regt. ; muster roll for Aug. and Sept., 1783; term of service unexpired, 6 mos. 6 days. Volume 2 page 756. Bucklin, Prince. Private, Capt. John Holden’s (2d) co., Col. Christopher Greene’s (1st Rhode Island) battalion; muster roll for July, 1779, dated Camp at East Greenwich; enlistment, during war; reported absent by leave. Volume 2, page 756. The American Civil War was a brutal war, with chances of death or dismemberment extremely high. Yet many Bucklins volunteered because of their belief in either the Union or in the abolishment of slavery. What follows are a few notes about just two of distinguished heroes, among the many Bucklin heroes of the Civil War. John Bucklyn won the Medal of Honor. But his father had changed the Bucklin name to Bucklyn. Read about his valor and the medal. Charles M. Bucklin was Regimental First Sergeant of a Colored Troop Infantry Regiment. The army did not allow blacks to be officers and non-commissioned officers. The enlisted men in the units were made up entirely of blacks, many of them slaves who either volunteered or were taking the place of a white owner who had been drafted. (Hence, the Bucklins in the following listing that are enlisted men are presumably blacks owned by Bucklins and given that last name by the owners.) In forming the Colored Troop Infantry Units, there was a need for white officers and non-commissioned officers. It was thought, correctly, that persons who volunteered for those leadership positions would be unable to secure promotions easily. Hence, it took moral courage and determination to volunteer to be one of those white leaders of the Colored Troops. We are proud that Charles M. Bucklin, served as the Regimental First Sergeant of the 81st Regiment Infantry and George Bucklin as a Captain of the 11th Heavy Artilery. Note: 81st Regiment Infantry was organized April 4, 1864, from 9th Corps de Afrique Infantry. Attached to 2nd Brigade, 1st Division, Corps de Afrique, Dept. of the Gulf, to July, 1864. Consolidated with 88th and 89th United States Colored Troops July 6, 1864, to form new 77th United States Colored Troops. Reorganized July, 1864, by consolidation of 87th and 95th United States Colored Troops. Attached to Engineer Brigade, Dept. of the Gulf, to September, 1864. 2nd Brigade, 2nd Division, United States Colored Troops, Dept. of the Gulf, to February, 1865. Garrison of Port Hudson, La., Dept. of the Gulf, to July, 1865. Dept. of the Gulf to January, 1866. It’s service was post and garrison duty at Port Hudson, La., and in the Dept. of the Gulf entire term. Mustered out January 30, 1866. The 11th United States Colored Heavy Artillery had originally been raised and organized as the Fourteenth Regiment Rhode Island Heavy Artillery. On 28 August 1863 the first company was mustered into Federal Service. As customary for all black units raised during the Civil War, the officers of this regiment were white, all of whom had seen previous service. They were commissioned by the President of the United States, after having passed a rigid examination before a military board convened at Washington of which Major General Silas Casey of the U.S.Army, presided over. On 19 December 1863 the first battalion left Providence and sailed from Newport for New Orleans, Louisiana, to join General Banks, commanding the Department of the Gulf. On 8 January 1864 the second battalion left Providence to join the first battalion in New Orleans. In March 1864, while units of the 14th Rhode Island United States Colored Heavy Artillery were stationed at Fort Esperanza, Matagorda Island Texas, Companies A, C, and D were placed under arrest for refusing to accept their pay, which was 3 dollars a month less than what regular white troops were receiving. The ringleaders of the protest were tried by general court-martial, and sent to Fort Jefferson, Florida. On 15 April the third battalion joined the Regiment at New Orleans. The whole Regiment was subsequently transferred to the Department of the Gulf, and its designation was changed by general order, first on 4 April to the 8th United States Heavy Artillery (Colored), and then in May, to the Eleventh United States Heavy Artillery (Colored). On 5 July Colonel Jacob Hale Sypher of the United States Army was appointed by the President to command the Regiment. The bulk of the service of this Regiment consisted of garrison and picket duty in several posts in the Department of the Gulf. Because of lack of volunteered time or money, military service records have not been much searched by us, but we do have a preliminary list of Bucklins that gave military service during the American Civil War. To date, all Bucklins we have located appear to have done their military service in the Army. The persons in the following list that do not have the name of “Bucklin” are children of a mother with the maiden name of Bucklin. The records are displayed as followed: Name and Identifying reference number associated with the name in our records, and then in order: Date on which he was serving in the designated unit, any available Additional Description, Date of Discharge, if known. Bucklin, Daniel D-2033 26 May 1862 RI, Co A, 10th Infantry Unit, Sgt. Bucklin, George-2036 9 Oct 1862 RI, Co F, A, C, 12th Infantry Unit, 1st Lt.
Bucklin, George A-2053 26 May 1862 RI, Co H, 9th Infantry Unit, 2nd Lt.
Bucklin, James A-2042 26 May 1862 RI, Co H, 10th Infantry Unit, Sgt. Bucklin, Jeremiah-2046 14 Aug 1862 RI, Co E, Battery, 1st Light Artillery Unit, Cpl. Bucklin, Lawrence-1994 16 Jul 1863 MA Co K, 18th Inf, Pvt; Co B, 32nd Inf, Cpl. Bucklin, Merrill R-2062 15 Aug 1861 Corporal, 1st Vermont Cavalry, Company G.
Bucklin, Stephen Randall-996 17 Apr 1861 RI, Co E, 1st Inf, Capt; RI, 3rd Hvy Artillery, Lt Col.
Nellis, James Henrick-2684 18 Aug 1863 enlisted in Jefferson Co, NY Co H. 18th Calvary as a private. To the present day, Bucklins have continued the family traditions started when the American colonies struggled to become a country. Bucklins have served, and will always serve with honor, courage, and devotion to preserving the United States values that we cherish. Spc. 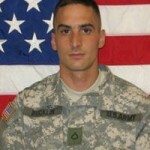 Brock Bucklin, 28, of Caledonia, Mich., who was assigned to the 1st Battalion, 68th Armor Regiment, 3rd Heavy Brigade Combat Team. In June, 2006, Bucklin, a mortar specialist, was fatally injured in an equipment accident while serving in Iraq. Brock Bucklin, 28, joined the Army in August 2004, about a year after his twin brother, Brad, did.